If you are looking for the best way to maintain an immaculate front yard without the nuisance of climbing a ladder, a pole saw is a great choice. Although we have the corded and cordless pole saws, the cordless models offer you with more portability. The best cordless pole saws are lightweight, powerful, and easy to use. 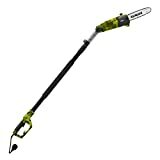 With this tool, you can also access the hard to reach areas on hedges and trees, for easy pruning and trimming. Cordless pole saws are not something you may need; they are a necessity. This has made them very popular today. Because of the complexity of these tools, many people do not know what to look in the best pole saws. This guide offers you with all the relevant information that assist you to choose the best cordless pole saw that meets your needs. With Greenworks PRO pole saw, landscaping is now easier. 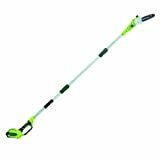 This is powerful cordless battery outdoor equipment that allows you to trim the tree branches for an amazing look. Unlike other models, this unit has less noise, less vibration, and mess. Additionally, this unit features brushless motors, which are more strong and reliable. Dominate the nature’s highest limbs with this versatile chainsaw from Remington. You can now landscape your yard like a pro with this tool. First, the chainsaw is light making it easy for anyone to use. Second, it has a long aluminum pole that provides improved reach. Additionally, this model boasts of a powerful motor that powers through most branches with incredible ease. This model is a perfect choice for pruning trees and hedges that are hard to reach. Using a ladder can assist you in reaching higher places. However, there are increased chances of injuries when using a power tool while using a ladder. 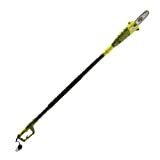 This unit has a powerful motor and long pole that allows you to reach tree branches effortlessly. This is another high-end pole saw from Sun Joe. It takes difficulty and danger out of your trimming overgrown hedges and trees. It features a telescoping pole that extends to about 7 ft. This provides you with up to 14 ft overhead reach. For your convenience, this unit also comes with a multi-angle head that adjusts from zero to 30 degrees. This is a respectable choice especially if you would want more power. Unlike other models, this unit offers you with more power, allowing you to cut larger tree branches with ease. It is also equipped with a 20-inch dual action steel blade for optimal durability and performance. Besides, the machine has three positions pivoting head that adjusts the blade for trimming at multiple angles. The WORX WG309 pole is an innovative tool that enables you to make a clean, safe and fast cut on those hard to reach areas. This removes the need for a ladder, which is considered unsafe especially when using a power tool. The eight-foot extension pole facilitates this. You can also remove the extension pole and use it as a powerful chainsaw that takes care of all your home landscape designing. 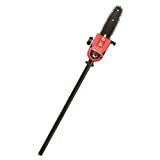 Gas powered pole saws offers you with more power than the battery operated models. They are also better than electric models that are to their portability. This unit has a quick start technology meaning that you do not have to struggle pulling the chord to start it. The tool also has an auto oiler that keeps the chain properly lubricated. 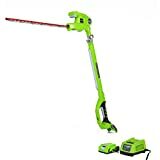 For added convenience, this unit accepts attachments that turn the pole into a blower, edger, as well as hedge trimmer. This saves you a lot of money that you could have used to purchase each of these tools separately. With a 6.5 Amp motor, this tool has the ability to cut the most stubborn tree limbs of up to 7.5 inches thick. It also boasts of a telescoping pole that gives you up to fifteen feet overhead reach. Another reason why most people prefer this model is the convenience. Unlike the gas models, this electric pole saw provides you with reliable power with the push of a button. If you have many trees with overhanging branches that need trimming, you need a portable pole saw with more power. This tool is fitted with a high-quality 40V battery that offers you with strong power for a longer period. You do not have to charge in-between your trimming sessions with this tool. Moreover, the tool has an easy adjust chain-tensioning system that allows you to tighten the chain quickly. There is a lot to love about this pole saw. The Remington RM1025SPS has a versatile design that enables you to tackle multiple gardening chores. 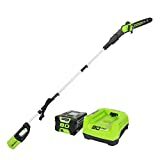 This makes it ideal for all small to medium trimming tasks around your home. The 8-amp electric motor and instant start let you cut the branches fast and easily. Additionally, this tool has a low kickback, and a ten-inch bar makes pruning and lopping simple. The best cordless pole saw will save you a lot of time and allows you to work without the need of a ladder. However, you need to choose an appropriate choice that meets your needs. With the wide range options available, this is not an easy task. Below are some of the factors to consider getting the best pole saw that meets your demands. Cordless saws are powered by either gas or battery. The gas-powered models tend to have more power and longer run time. However, some are not eco-friendly as they emit fumes that are detrimental to the environment. The battery-powered models are more eco-friendly, light in weight, and easy to use. However, you need to charge constantly when working on a large area. The ability to control and balance the tool will affect the cutting ability of the saw. Cutting head finesse is crucial for both your safety and the good of the tree. When considering the extended operation, make sure that the pole saw remains balanced when at its maximum extension. The above cordless pole saws will help you to trim the trees and hedges like a professional. This will save you a lot of money on hiring professional service. However, before you settle on the best model, ensure you have considered the factors listed above. Best of luck!